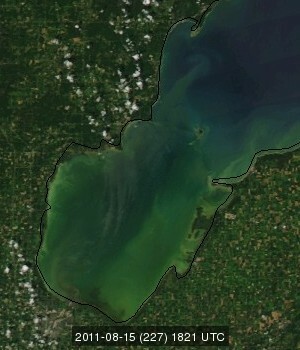 Saginaw Bay is being called a “hot spot.” Unfortunately, the title refers to shoreline muck, or dead algae. The Detroit News recently featured the Bay City state park, highlighting the smelly muck that gathers at the shoreline of a mile-long public beach there. Algal blooms related to the muck also have made tap water taste bad, or worse, in the Bay City area this summer. Residents have been complaining about the muck for years. Experts say it’s partly to blame on invasive zebra and quagga mussels that have filtered and cleared the water in the bay and other parts of the Great Lakes. That has allowed more sunlight to penetrate the water and spur algal growth. The mussels also feed on phosphorus in the water and secrete it in a more concentrated form. The bay is picking up excess phosphorus applied to lawns and other land in 22 counties that drain to the Saginaw Bay watershed. Bay County has had a ban on most residential phosphorus applications since 2009. A statewide ban goes into effect on Jan. 1, 2012. Experts say that may help control algal growth in the bay in coming years. In the meantime, people who don’t enjoy the mucky beach at the Bay City State Recreation Area will be able to cool off in a spray park. The park is due to open today (Friday, Aug. 18) next to a playscape at the state park. The playscape is located near an old public beach at the park, which is no longer accessible due to lower water levels, phragmites and other factors. The spray park is due to expand next year. It’s the first spray park to be built in a Michigan state park. The park was constructed with more than $300,000 in donations raised by a Friends group, and other funds from state park vehicle entry permits. And if you have any wonders about the water quality of Saginaw Bay, consider this: The spray park will be supplied with bay water that’s been treated and piped to the location.